Naomi Shemer (Hebrew: נעמי שמר‎, July 13, 1930 – June 26, 2004) was a leading Israeli musician and songwriter, hailed as the “first lady of Israeli song and poetry.” Shemer did her own songwriting and composing, almost single handedly creating a book of “Israeli popular hits.” In addition to her original texts, she also set famous poems to music, such as those of the Israeli poet, Rachel, and the American Walt Witman, and translated and adapted popular songs into Hebrew, such as the Beatles song “Let it Be” in 1973.In 1967, Jerusalem was divided between Israeli and Jordanian control, bisected by a no-man’s land of thorns, ruins, and barbed wire. This boundary was enforced by lethal Jordanian sniper fire. Noting a lack of contemporary songs celebrating the city, Mayor Teddy Kollek invited several songwriters to remedy the situation. 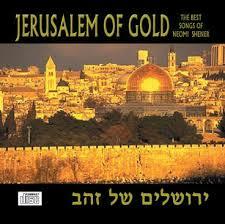 Only Shemer met the challenge, composing “Jerusalem of Gold” for performance at the Israeli Song Festival held on 15 May, 1967, the night after Israel’s nineteenth Independence Day. The then-unknown 19-year old Shuli Nathan was chosen to sing the song, and it became an instant hit. Three weeks after the song was published, the Six-Day War broke out, and the song became a morale-boosting battle cry of the Israel Defense Forces, with Shemer herself having sung it for the troops before the war and the festival, making them among the first in the world to hear it. On 7 June, the IDF wrested eastern Jerusalem and the Old City from the Jordanians. This contrasts with the joyous return from exile in the fourth verse, which Shemer wrote after the Six Day War. The line about shofars sounding from the Temple Mount is a reference to an event that actually took place on that day. Both the Colorado Hebrew Chorale and Kol Nashim perform arrangements of this Israeli classic in this anniversary year, revisiting a simpler time, when a unified Jewish Jerusalem was associated with a redemptive dream of future peace. Click Here to hear the Colorado Hebrew Chorale sing the Gil Aldema arrangement, recorded at their “Just in time for Passover” concert, at Kavod Senior Life, in Denver, on April 6, 2017. The Colorado Hebrew Chorale’s mission is to preserve, promote and celebrate the Jewish experience through song, by performing with and for diverse audiences. We are committed to multicultural outreach, education and Jewish community involvement.